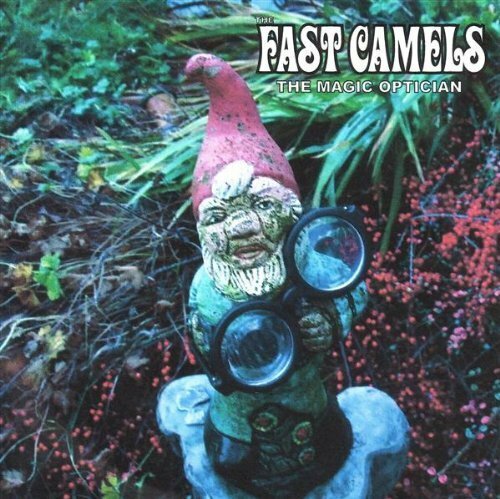 Love’s exceptional lead guitar figure Johnny Echols has said of modern-day Glasgow group The Fast Camels that they remind him of Love when the legendary LA group were just getting it together at Bido Lito’s club back in 1966. 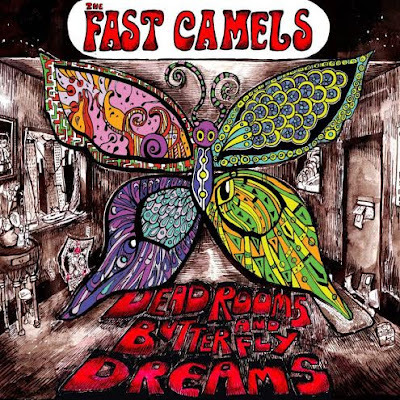 So it’s no surprise to learn that there’s an inherent inventiveness at work, and also a high degree of musical fluidity at play within the work of the Fast Camels. A vibrant intensity shines through much of their material, and often helps to propel their collective playing overall. And it’s this, coupled with a strong sense of identity – to say nothing of the pathos and particular sense of humour that can be heard shifting about inside the music being created here – that gives them a woven together definition, or at the very least sets them aside from a lot of groups that are happening on the current British scene. It’s also true to say that many groups whose origins lie over in the west coast of Scotland have inherited some of the qualities outlined above (more so if they’re especially blessed) when they gather to write and play music together. I couldn’t begin to list all of them but certainly the likes of The Poets, The Sensational Alex Harvey Band, and Teenage Fan Club are but a few of the city’s names which readily spring to mind. And so in considering the Fast Camels there is also this mixture of styles going on, gallant innovation, a creative originality beating at the heart of things, and oh yes a super-intended high fun quotient too! The Fast Camels issued their first album “The Magic Optician” back in 2007 as a one-off CD release on the Neon Tetra label. Even when heard today this is a total blast of fresh air, a set that sounds truly hip and happening, and easily as poptastically psychedelic in places as many names who’ve gone on to win thousands of fans and garnered many plaudits and column inches along the way… Openers ’50 Things On Your Mind’ and ‘Like A Magic Optician’ are perhaps the most ’67 British “Choc Soup” acid-sounding the group has ever been! Although ‘Comforting Things’ and the galloping advances of ‘Can You See Me?’ are also strong contenders here. The group’s widely-acclaimed follow-up “Dead Rooms and Butterfly Dreams” didn’t appear until seven years later when their own Magic Optician label unleashed it in the late summer of 2014. At times this comes across like a totally different sounding group altogether; the songwriting appearing more mature and inherently more serious in places; the influence of more west coast USA versus the British ’67 early Floyd and psyched-out beat angles coming over very much more resounding. There are very obvious differences too in the various expressions of guitar and vocal interplay.Definite flourishes of those distinctly offbeat musical textures and a certain, hard to put a finger on tangibility that is also heard throughout much of Love’s material can also be detected weaving its way in and out of the Fast Camels playing. ‘Privately Insane’ is one of this sets real standouts, the way it pulls and pushes itself forward in compelling art-jazz style waves. This in itself is a great homage to that ’66 Love sound. However, in both full-length collections we hear a modern-day group which is teeming with many such similar qualities and ideas as their forbears and, throughout, the group can be heard reaching out and striving for their own particular identity. Yes I know, we are lagging behind somewhat in time as this is now already April 2015 and so even their latest “… Butterfly Dreams” isn’t all that new today but, regardless, it is still pretty fresh on the ears and … well actually this is about as bang up to date as we’re gonna get. Well not quite as they now also have ‘Cobbler Clarence’ (their favourite song from the album) to get a taste of what constitutes this group’s humorous, down-to-earth conceptuality and sense of celebration as expressed through artistic enthusiasm and an ongoing burst of momentum. Despite it being kinda challenging, and engaging too, in a strange way it’s still a mightily odd choice for a single. Go here now to check it out for yourselves: http://youtu.be/Cfq76WtX9oM Purchasers of the single will also be rewarded with a bunch of non-album selections that include ‘She’s Seen Enough’, ‘Donnie’s Hearse Curse’ and the awfully-pun titled ‘Swiggin In The Griffin’ (a reference to a long-hip Glasgow watering hole) and, although not my favourite of their releases, showcases their continued fervour and wide-ranging scope; both Drew Sturgeon (lead vocalist and rhythm guitar) and lead guitarist Mark O’Connor are the group members responsible for initiating their highly enervating song craft art. From the very beginning of “The Magic Optician” the group has openly embraced the countless wide angles, oblique borders and grey areas of what constitutes the multi-coloured world of psychedelia. For the Fast Camels this comes, for the most part, in the shape of a raft of bounding beat-infused rockers and more out-and-out pop-psych styled toe-tappers. While they’re not too shy of bringing in overtly vintage-sounding phrases here and there, with many eclectic references influencing the way the songs are built upon, and the general direction and layers of each performance, equally they aren’t afraid of ringing the changes with some truly wistful, melodious and modern-thinking interchanges. ‘Like A Magic Optician’ from (obviously) ‘The Magic Optician’ as outlined earlier evokes the spectre of such as Syd Barrett’s early days and traipses through the toytown psych world quite successfully, while tracks such as ‘Golden Greeter’, ‘Penny Pinching Debt Collector’ and ‘Ken’s Sad Vice’ from “Dead Rooms and Butterfly Dreams” evince an atmosphere that comes almost from the opposite side of the spectrum, being much less psych-inclined too, and clad in something “other”. Here it seems they are going for a clever, if slightly more indie sounding approach with the songs’ rhythmic patterns owing more to the now than the then … And so it is with the presence of one or two challenging sounding snatches too that might perhaps be a little unfamiliar, or maybe not so comfortable – at least for a lot of psych and garage beat heads (who might want a slightly easier ride) but this is the bag they’re in. I do enjoy it when some groups don’t readily always fit neatly into my, or your bag too probably, as this can give them their own space and defining stance, a signpost of their own merit and making and can also invoke a sense of unity and of belonging; and not always to the pigeon-hole that you or I will automatically try to slot them into. As long as the material itself has appeal and stands out to gain our attention. Although The Fast Camels sound millions of miles away from either the likes of say The Soft Boys and REM, back in their very early days they held a similar position in the musical landscape of their day. Off kilter at times, we’ll certainly, but also highly appealing and with a great sense of occasion.